Louis-Philippe Demers and Bill Vorn have collaborated extensively on numerous robotic art projects since 1992. 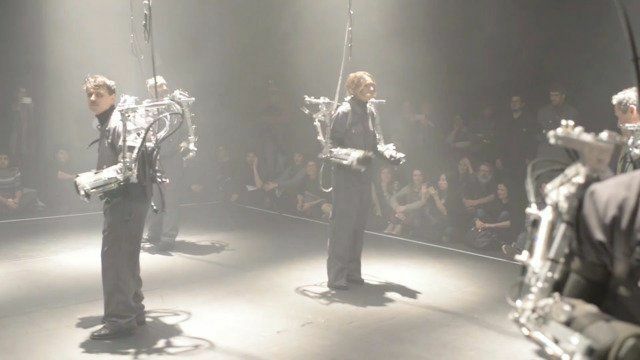 During this time, they have created several large-scale robotic, interactive installations and performances, including their latest production, Inferno where they created intelligent robotic components that act and react to the audience. so far producing more than 350 machines. His robotics works can be found in theatre, opera, subway stations, art museums, science museums, music events and trade shows. Vorn, based in Montreal, creates installation and performance projects involving robotics and motion control, sound, lighting, video and cybernetic processes. He pursues research and creation on Artificial Life and Agent Technologies through artistic work based on the Aesthetics of Artificial Behaviors. He holds a PhD degree in Communication Studies from UQAM (Montreal) for his thesis on Artificial Life as Media. He teaches Electronic Arts in the Department of Studio Arts at Concordia University (Intermedia program).